If improvements aren't made, the province's landfills could run out of capacity within the next 20 years, the government warns. TORONTO -- From coffee grounds, to leftover fettuccine alfredo, to the slimy, brown head of lettuce forgotten at the back of your fridge, the Ontario government is aiming to keep all organic waste away from landfills. It's an ambitious target for a province that generates nearly 12 million tonnes of waste a year -- more than 850 kilograms per person -- and only recycles about a quarter of that amount. In 2004, the Liberal government promised to boost the rate of waste diversion -- through recycling and composting programs for example -- to 60 per cent in four years. But 13 years later, the rate hasn't changed. Now, the government has set its sights on an even more distant target of 100 per cent. Hence the Strategy for a Waste-Free Ontario, which aims to create a "circular economy," where waste is considered a resource that can be recovered, reused and reintegrated. One area of focus is organic waste, which decomposes in landfills producing gases, such as methane, that contribute to global warming. Ontarians generate 3.7 million tonnes of organic waste per year, and greenhouse gas emissions from the waste sector -- mostly organics in landfill -- account for six per cent of the province's total emissions. The government's organics action plan, to be implemented next year, includes the possibility of a ban on sending organics to landfills. More than half the food waste in the province is generated at home, but the residential sector has steadily improved how much of that is diverted from landfills, with a rate now just over 50 per cent. In contrast, only a quarter of the food waste produced by the industrial, commercial and institutional sectors is diverted. Fundamental changes are required in how people think of and treat organic waste, said Environment Minister Chris Ballard. "Tinkering isn't working," he said. "This is as revolutionary, I believe, a plan as the original (recycling) blue box when we rolled it out and got everybody excited." Organics should be the next target on the waste frontier, experts say. "We're at a bit of a plateau in terms of diverting that waste," said food and organic waste consultant Paul van der Werf. "We've probably tapped out just about everything that people will do on a voluntary basis." Zero waste sounds like an "aspirational goal," but Ontarians have to decide if that's something worth aspiring to, van der Werf said. "If we (do), then we need to put some pretty strong measures in place to change what we're presently doing and change our behaviours," he said. "If we kept the status quo in our system and just tinkered a little bit, would we get to zero waste? No, not in a million years." While nearly all households in the province have access to recycling programs, not all municipalities have organic waste programs. Most of the larger ones -- covering around two-thirds of the population -- have green bin programs, but not everyone is using them properly. "In Toronto, audits consistently show that even though people use their green bins, 40 per cent of what they're putting in the garbage actually should have gone in the green bin," said Emily Alfred of the Toronto Environmental Alliance. The City of Kingston consistently has one of the best organic diversion rates, but still battles resistance, said its manager of solid waste. "Most of the reasons why people don't want to use it is this perception that it smells and that it's gross or it attracts rodents," said Heather Roberts. "(But) consider that all of the things that would go into your green bin would still go into your garbage bag." Kingston is also one of just nine municipalities that has extended green bin programs to condos and apartment buildings, but it's not mandated, so there isn't a lot of uptake, Roberts said. The City of Toronto offers organic collection at about 65 per cent of its multi-residential buildings, and a few receive private pick-up, officials said. But most Ontario municipalities still send their food waste from multi-residential buildings to landfill. Municipalities with more than 50,000 people are required to have a leaf and yard waste program, but there is no such requirement yet for green bins. Mandating collection of food and organic waste is another tool Ontario is considering, but smaller municipalities say that's not feasible. Dan Finnigan, environmental services manager for the town of Mattawa, said his community would need provincial support for a composting program. "For the Town of Mattawa itself it would be a great program, but to be quite honest I think I would need some assistance from the government to maybe get it going and get it started up," he said. As Ontario considers a disposal ban on organics, it is looking to the examples of Nova Scotia and Metro Vancouver, which already have them in place. Nova Scotia banned organics from landfills two decades ago. Even with a disposal rate much lower than the Canadian average, about half of what's in the waste stream is still banned material, said Robert Kenney, the province's recycling development officer. "A disposal ban is...an incentive for municipalities and the private sector to act," he said. "You don't get everything. You can't get everything." Metro Vancouver's recent ban was eased in, with inspectors targeting only loads with more than 25 per cent visible food waste and issuing surcharges, said Andrew Marr, the director of solid waste planning. "What we were trying to target was, if you will, the worst offenders right off the bat," he said. "We weren't so concerned with getting every single apple core that somebody might be throwing out." It has been successful so far, Marr said. In the first year, 60,000 more tonnes of organics were diverted away from landfills and the garbage stream dropped from 36 per cent organics to 28 per cent. On the commercial side, just a quarter of restaurants diverted organics before the ban, and now that figure is about three quarters, Marr said. But that represents an added cost, which isn't easy for all to absorb. "The line you have to cross is: is it more cost effective to compost this material or to throw it in the trash?" said James Rilett, the Ontario vice-president of Restaurants Canada. The cost for the industrial, commercial and institutional sector to dispose of waste is $118 per tonne to the U.S. and $134 per tonne in Ontario, but $205 per tonne to divert. The Provision Coalition works with food and beverage manufacturers to integrate sustainability into their business model, aiming to save businesses money by preventing food waste in the first place. It's common for food producers to turn waste into animal feed, but Cher Mereweather of the Provision Coalition said her organization will point out the energy, labour, water and raw ingredient costs that went into making that product. "We really need to move away from this concept of, 'Well, it's OK, it gets composted,' because there's a significant cost and environmental impact of that wasted food in the first place," she said. Some manufacturers send product that won't sell or is mislabelled to food banks, which is where organizations such as Second Harvest come in. 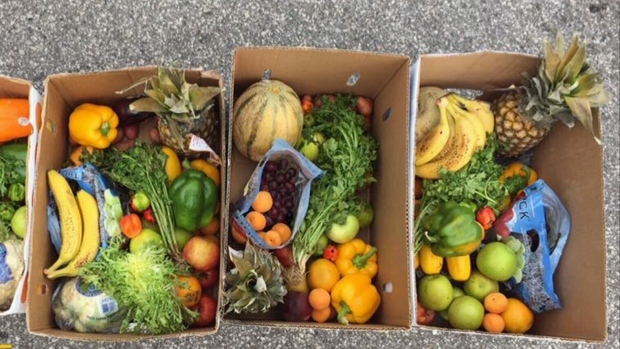 The food rescue charity picks up the food and delivers it to social service agencies, to the tune of about 4.7 million kilograms this year. But they won't pick up anything less than 45 kilograms worth of food, said executive director Debra Lawson. To ensure smaller food donors can participate in similar programs, Second Harvest is developing a web-based platform that would connect them to the closest agencies in need. Lawson said it's hoped a pilot can be running next spring. The Retail Council of Canada said grocery stores have a number of initiatives for trying to prevent food waste, including partnering with food banks, selling blemished fruit at a discount, and educating customers. The restaurant industry points to customer behaviour as a major challenge as well. Luc Erjavec, the Atlantic vice-president of Restaurants Canada, said Ontario should focus its attention on restaurants' kitchens. In Nova Scotia, owners found it easier to control the back-of-house waste stream. "When you get on the customer side it gets very different," he said. "We can't start tipping over garbage cans and trying to sort through the waste to make sure it's not contaminated." Universities face the same dilemma too, said Dave Cano, the sustainability manager at Western University. "If there's no proper signage or proper education around how to use a composting program, then you most likely will find people putting things in the wrong stream," Cano said. Ballard said he sees a large role in the waste-free plan for the private sector, which can come up with innovative solutions and create jobs. "We need to turn it into an industry," he said. "Let's not look at it like waste. Let's look at it like a resource and treat it like a resource like anything else we pull out of the ground or from the air."